W. L. (Hutch) Hutchins, the founder of our company used to say "I know people who get on a power yacht to go somewhere. But, when I get on my sailing yacht, I am there." His yacht wasn't only a means to an end. It was also an end in itself. It took him places, but it was equally also his destination. Any boat should be seaworthy, first and foremost. It has to get you there and back safely. But a boat can be so much more. A well-crafted yacht should be an object of pleasure and a refuge even before you weigh anchor. Put simply, whatever the harbor, the boat itself should be a place you want to be. 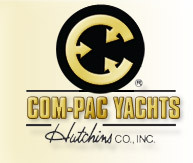 Since 1974, we have been building Com-Pac Yachts with this ideal in mind. A Com-Pac Yacht, no matter the size, will perform as advertised, be durable, be serviceable and be able to satisfy your sense of adventure. Thousands of Com-Pac Yachts are sailing world wide. Many skippers are safely taking their boats and crews on extended cruises and adventures. In addition, our boats also aim to satisfy your senses and fulfill your expectations of pleasure and pride of ownership. You'll find immeasurable joy in day sailing, sail-camping, weekending, and cruising — and also in just "hanging out" on your Com-Pac yacht. 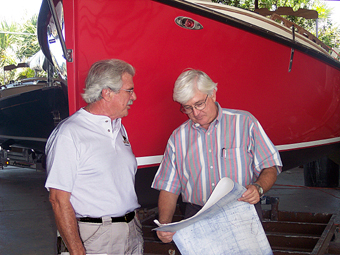 Hutchins Co., Inc is today owned and operated by us, Richard and Gerry Hutchins, two brothers who learned the [craft and] business of boatbuilding early on from a father who was a master and a pioneer. We are proud to carry on his example of building quality boats that will serve you as a destination in their own right. When the family name is on the product, you have an extra reason to want every boat that leaves your shop to meet the highest standards. We remain a small enough company to be able to provide you with personalized service and attention to the details of your boat. But we are also a large enough company, with a recognized name in the industry, to be able to build efficiently and meet that other important goal of boatbuilding: value for price. We invite you to view our line of yachts. Please call or use our online Information Request Form.